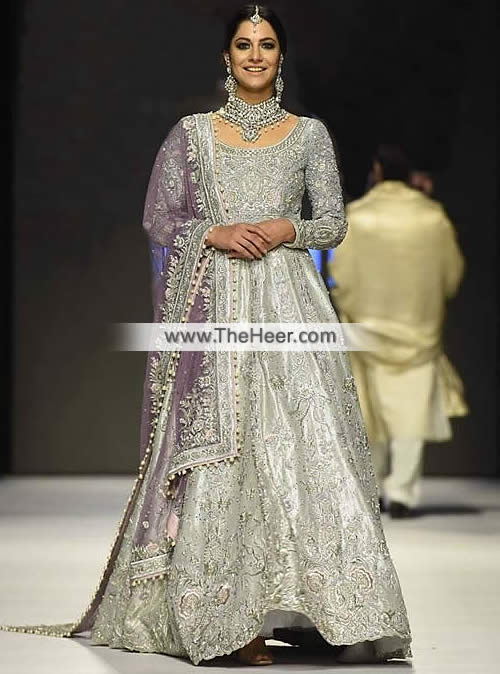 Top: Silver Banarasi Jamawar Floor length Maxi features classic and marvelous embellishments and embroidery accent the front, back, sleeves and hemline. Full length sheer sleeves. Round neckline. Concealed zip closure back. Lining inside. Scalloped edges. Bottom: Silver Raw Silk Comes with plain straight trouser having half elasticated waist. Dupatta/Veil: Purple Crinkle Chiffon Dupatta contains flourishing embellishments and applique work border on edges. Sequins spray and tiny sized ornamental motifs all-over. Dangling bead balls on edges. Edges finished. Epitomize the timeless elegance of a bride wearing this momentous bridal maxi dress. Click the button below to add the MX6575 Silver Purple Banarasi Jamawar Raw Silk Crinkle Chiffon Wedding Maxi to your wish list.